'Low-hanging ambitions and straightforward conflict between negotiators of harm and reform renders Lucknow Central a surprising watchability,' says Sukanya Verma. Just last month, Habib Faisal's Qaidi Band harped on foolhardy undertrials setting up a musical orchestra. Lucknow Central builds on an identical premise, but makes fewer mistakes and has superior music. First-time director Ranjit Tiwari's undemanding fairy tale ambles around an innocent convict discovering fame and friendship within high-security prison walls. Writer Aseem Arora's low-hanging ambitions and straightforward conflict between negotiators of harm and reform renders Lucknow Central a surprising watchability. A good portion of Lucknow Central, its most languid too, is dedicated to the set up triggered by a Moradabad native (Farhan Akhtar) and music band aspirant's life sentence for the murder of an IAS officer. A year-and-a-half later he is moved to Lucknow jail, facing the likelihood of the death penalty -- only neither the magnitude of the indictment nor his trauma comes through in its gloomily lit frames and sluggishly paced environment as he braves bullying inmates and ill-tempered wardens (Ronit Roy). If there's a Bachchan-sized conviction in his quiet brooding and imminent camaraderie around the classic foes-turned-friends narrative, a giant screen running Agneepath reiterates it most dramatically. Its scant pop culture suggestions for effect and schmaltzy climax befitting retro sensibilities aside, Lucknow Central is mostly undemonstrative. There is a strange disregard for details in Tiwari's filmmaking, a relentless atmosphere of interactions that seems to transpire outside the screen or sneakily manifested conspiracies the viewer isn't privy to. If the goal is subtlety, it backfires; the upshot is sloppy and vague. It is only post-interval Lucknow Central shakes off its sleepy momentum and cryptic musings to lighten up and chronicle how Farhan and his band of accomplices brush up on music to perform during the upcoming Independence Day celebrations, alongside bands hailing from various prisons of Uttar Pradesh and boosting its chief minister's (an excellent Ravi Kishen) image as part of an elaborate PR exercise. Farhan's choice of band mates -- engineer (Deepak Dobriyal), cleaner (Inaamulhaq), tailor (Rajesh Sharma), key maker (Gippy Grewal) -- suggests there is more to this collaboration than making music under NGO activist Diana Penty's provision and top cop's (Virendra Saxena) indulgences even if the ever disapproving jailor sees through their plot. Ronit Roy's snark overload is already in stereotype territory yet his suave menace and dark misogyny never misses the mark. As the target of his constant barbs, Penty is ten shades too glamorous for the part but when she comes down on him in the 'that was petty' scene, she stands tall. The performances, never hitting a false note, work even when the characters are steeped in filmi familiarity. 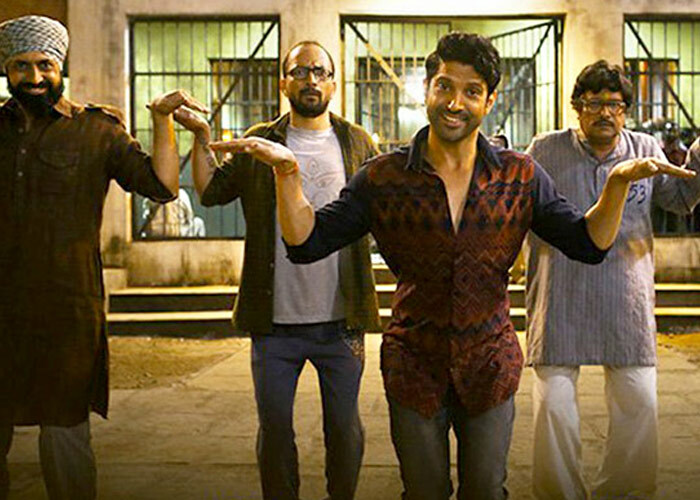 Farhan conveys a dignity and determination that is mild mannered but deeply effective whereas his cronies Deepak Dobriyal, Rajesh Sharma, Inaamulhaq and Gippy Grewal infuse a warmth and buoyancy that stands out and blends in, according to the requirement. That the audience isn't well versed in the background of their criminality contributes to their favourable imagery. Lucknow Central comes alive in their combined chemistry and culminates fruitfully in Jee Karda, a spectacular recreation of the Monsoon Wedding original. The film doesn't make any significant statements on the legal system or rehabilitation beyond tedious displays of violence or stray moments, like when the out-on-parole convicts realise they are unwelcome, unfit for the world that has moved on without them. Of course the harmless temper and measured fervour of Lucknow Central's key players insists they are not all bad. And for a while, you believe it too!